Yours will arrive in the factory sealed bag. The box picture is for reference only. FREE scheduling, supersized images. Yours will arrive in the factory sealed bags. The box picture is for reference only. FREE scheduling, supersized images. Their are 5 Magenta, 8 Yellow, and 4 Cyan. I'm not sure what the dates are because they aren't printed on the bags. Lexmark X1100. Lexmark X1185. Lexmark X2250. Lexmark Z13. Lexmark Z25. Lexmark Z35. Lexmark Z605. Lexmark Z615. Box picture is for reference only. Black & Color. EXPIRED 2006. LEXMARK 17 OPEN BOX BUT SEALED POUCH. Also open box open pouch Lexmark color 27. as a bonus.Both are open box and EXPIRED. 1 LEXMARK 70 -BLACK (12A1970). 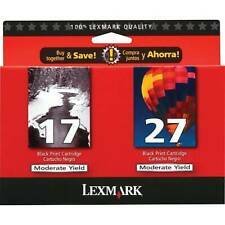 (R) Lexmark 17 & 27 Ink Cartridges Genuine Sealed Combo Pack Black Color RedBox. Condition is New. Shipped with USPS First Class Package. Trending at $31.25eBay determines this price through a machine learned model of the product's sale prices within the last 90 days. Trending at $20.98eBay determines this price through a machine learned model of the product's sale prices within the last 90 days. Trending at $16.04eBay determines this price through a machine learned model of the product's sale prices within the last 90 days. Lexmark 17 & 27 Ink Cartridges Genuine NIB - Combo Pack - Black/ Color - Red Box. Condition is New. Shipped with USPS First Class Package. For use with: Lexmark P3150, P707, Z12, Z22, Z32, Z705 and Z715. Lexmark P3150. Lexmark Z12. Lexmark Z32. Lexmark Z715. Compatible Printers. Lexmark X Series X75, X1150, X1185, X2250, X1100, X1270, X1240, X1130, X1110, X1140, X1155, X1160, X1170, X1180, X1190, X1195, X1290, X2230, X2240. Lexmark Z Series Z13, Z23, Z25, Z33, Z35, Z515, Z605, Z615, Z611, Z645, Z517, Z510, Z23e, Z24, Z25L, Z25LE, Z34, Z35LE, Z35t, Z601, Z602, Z603, Z612, Z614, Z617, Z647 LA LV. 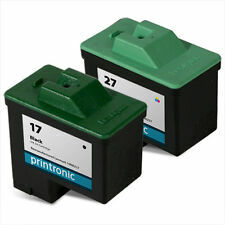 Lexmark Twin Pack #17 Black and #27 Color Print Cartridges-10N0595. Condition is New. Shipped with USPS First Class Package. Not sure how old they are. ITEM #: Lexmark 17/27 10N0595, 27 10N0227, 17 10N0217 Model MODEL #: Lexmark 17/27 10N0595, 27 10N0227, 17 10N0217 Print Technology: Inkjet. Lexmark Color Jet i3, Z13,Z23,Z25,Z33,Z35,Z5000. Lexmark 17/27 10N0595, 27 10N0227, 17 10N0217 Manufacturer Color: Black And Color. 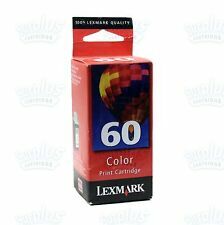 Lexmark 60 Color Ink Cartridge 17G0060 Genuine Sealed. Condition is New. Never used or opened. In original packaging. Please check out the photos. Ask any questions. Shipped with USPS First Class Package. GENUINE Lexmark 27 Color Ink Cartridges (10N0595) Color Only SEALED!!! 4.5 out of 5 stars - GENUINE Lexmark 27 Color Ink Cartridges (10N0595) Color Only SEALED!!! 17 product ratings17 product ratings - GENUINE Lexmark 27 Color Ink Cartridges (10N0595) Color Only SEALED!!! For use with: Lexmark i3, X1110 AIO, X1130, X1140, X1150, X1155, X1160, X1170, X1180, X1185, X1190, X1195,X1240, X1250, X1270, X2230, X2250, X74, X75, Z13, Z23, Z23e, Z24, Z25, Z25L, Z33, Z34, Z35, Z515, Z517, Z600, Z601, Z603, Z605, Z611, Z615, Z617, Z645. Trending at $20.54eBay determines this price through a machine learned model of the product's sale prices within the last 90 days. Part Number: 10N0217. Fuji Xerox. Color: Black. Condition: Surplus - New, never used. It may have expired date codes, be missing the box, have shelf wear, tears, etc. Quantity per box: 1. X-1180 X-1185. 2pk GENUINE Lexmark 17 27 Black and Color Ink Cartridges Combo Pack New. Condition is New. Shipped with USPS First Class Package. INVENTORY LOCATION Our goal is to provide you with a Superior Product and Excellent Service. all other areas. If you have a problem with your item or feel that you can not provide. from 10:00 AM to 5:00 PM. The world's largest collection of classic Corvettes and parts can only be found at ProTeam Corvette Sales in Napoleon, Ohio. ProTeam Corvette Sales has long been recognized as the nation’s leader in classic Corvette sales, service and restoration. GENUINE LEXMARK! Communication is often the key to solving issues. GOOD LUCK ! YOU WILL RECEIVE EXACTLY WHAT YOU SEE IN THE PICTURES. Policies (. I TEM D ETAILS ). 2 Black 105XL (1 loose, 1 in foil). 5 Yellow 100XL (4 in foil, 1 loose). 2 Blue 100XL (2 loose).